Out cook the biggest and best with this Super Value Best Tri Tip, Steak and Rib Rub Seasonings. Make your mark with Jake's premium Rib Rub Seasonings. Family secret spices combined with generous amounts of Natural hand selected herbs, brown sugar, SPG (Salt, Pepper and Garlic) and onion to deliver a savory mouthwatering flavor while giving the meat a golden color, with the lightest hint of smoked hickory. to compliment the marination process. Now you can create the best Jake's Tri-Tip with Bourbon Glaze, ribs, chops, steaks and chicken you've ever tasted. This is the 1st in our series of rib rubs. Dry Rubs are designed to delivered powder and granule spices mixing with the moisture of meat being drawn into the fiber in a form similar to capillary action. As the moisture dries the spices are absorbed deeper into the meat acting to marinate the meat and impart flavor. In most cases, salt and pepper are the key ingredients for a great steak. However, salt and pepper cannot deliver the complex flavors that many people seek to parallel the taste of the meat. Our Tri-Tip, Steak and Rib Rub utilizes a number of key ingredients to impart flavor while complementing the existing taste of the meat. We highlight just how special our combinations of sugars, salts, herbs and spices are to create a satisfying lift of flavor while not overpowering the real taste of the meat. The result of this rib rub is flavor that leaves the meat with a golden brown tint which of course is excellent. The Best rib rubs can be sprinkled in or spooned onto meat. The rub is not spicy unless you consider black pepper to be spicy. There is just a hint of natural smoke that does not overpower the flavor of the meat. You can achieve amazing results by shaking on then wrapping the meat and letting it rest in the natural dry rub for about 45 minutes to an hour. Grilling is easy just place on a grill with medium to medium-high heat at about 225 degrees for slow barbecuing or 275 degrees for quicker barbecue. Of course higher heat requires more consistent watching of the flame to ensure the meat doesn't burn. In summary, this multi-award-winning Rub makes your barbecue job easier by marinating effortlessly. You can produce a wonderful mouthwatering barbecue is little or no real time at all. Some say that our seasonings remind them of Texas, Mississippi, Florida, New Mexico, style barbecues. The rub marinates within a minimum time frame of 45 minutes or for a full cycle at 4 hours. The rub can be left on for overnight marinating and will deliver a light smokiness and golden brown color to the meat. Because this natural dry rub is versatile it can be taken on camping trips, to the park, to family barbecues, on overnight trips and more. Add Products To Cart button and follow to Checkout. Buy Jake's Best Tri Tip, Steak and Rib Rib Rub for sale Seasoning TODAY! Use code: 1707200910 with any item and receive a 10% discount. Enter the code at checkout to receive your discount on Jake's Famous Tri Tip, Steak and Rib Natural Dry Rub for sale. Comes in a clear and semi-translucent containers with spoon and shake top. Container measures 2.5" diam. x 6" high. Larger sizes available. ***Note: This product is shipped with Jake's basic white label direct from the factory. 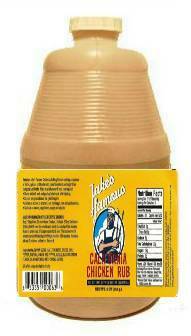 At Jake's Famous we guarantee to deliver the best possible products to improve your barbecue experience. If you feel that you are not satisfied with your received products contact us and we will work to replace them.